Recently finished going through this one as a player in a PbP (Play by Post). 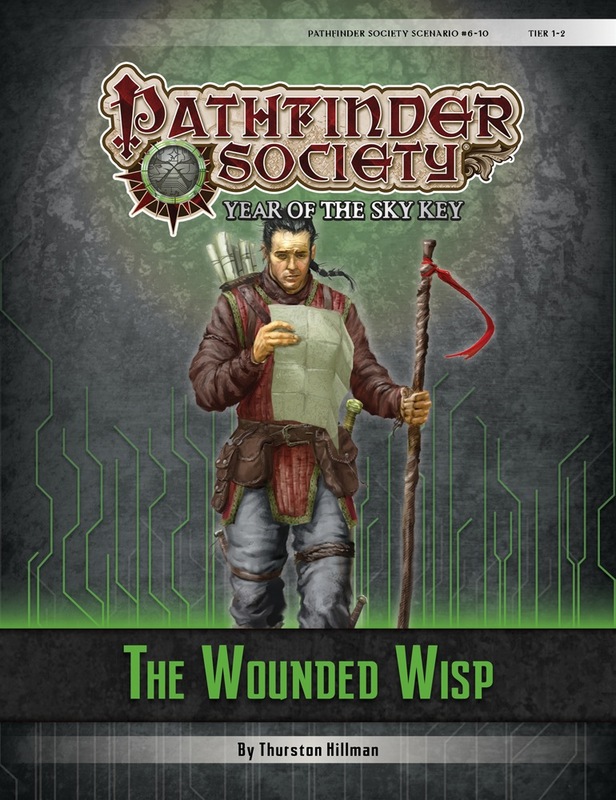 Wounded Wisp succeeds on all these fronts, delivering an interesting and well-rounded adventure that is likely to be memorable for some time. Top it off with handy boons and chronicle purchases and its no wonder that people like it as well as they do. The encounter under the Wounded Wisp is really out of place, so close to a safe area. Also, law abiding characters don't have a good excuse to break into Fimbrik's house, potentially stalling the scenario. Other than those two, everything else worked well. This scenario also stands out as one of the few that gives a good sense of accomplishment and meaning at the end. This is reinforced by the handout recieved after the completion of the scenario, that details the impact of your actions. Its really satisfying to have something like this! Well-crafted, eminently replayable scenario. Bravo! - Combat is reasonably well balanced, easy for the most part and moderately challenging for the finale. - There is a minor hiccup in the scenario writing where a certain choice is not clarified as to how it is chosen. But GM discretion solves that problem easily. I -LOVE- this scenario. While I think that, thematically, 5-08 The Confirmation should be the first scenario a character plays, I think I prefer this one. It is the other half of what being a Pathfinder is to me: investigation investigation investigation! It's definitely the "Report" side of the motto! I love the open ended nature and how it helps the players feel empowered about choosing where to go. Maybe I've run this too many times, but I don't get what a lot of people are saying about "too much prep time". Yeah, it can definitely help to pre-roll some randomness here, but I usually have some downtime while running to do that at the table. Typically, I'll walk my players through the intro, and when they hit the part where they read the two letters, I roll up the cleric and the 3 names, and which one is the "real" one, and refresh myself on the cleric's RP style. By the time I'm done, they're usually ready to go, and if not, I usually have enough time to score a bathroom break. (If you're a new GM running this, it might help to make notecards for each cleric with motivations and how to bypass as an easy reference.) I also assemble the multipart handout with paperclips. definitely saves on the cut and paste! I also love the new handouts per season. I can't wait to see Season 8's new handout! Overall, one of my favorite scenarios, and my favorite evergreen to date! I GM'd this for a table of new PFS players last weekend, and had a co-GM who was a great help setting up and prepping things. The scenario requires a brutal level of prep to play decently. Also, there's so many small details and bits of info to fill in (not all clearly marked), that someone who is unfamiliar with Golarion could run into serious issues - again, without my co-GM to fill in the spots that both I and the players missed, this would have derailed several times. I can see how this is a solid segue into The Confirmation, but overall I think The Confirmation is a better-written/scripted scenario. Setting-wise, it's a great play - but it can take several days of solid prep to pull it off successfully. Even as an evergreen Tier 1-2 adventure, I won't run this for a group again. Introduce the settings of Society and the Innersea, no matter you are new for PF, veteran player just into PFS, or experienced PFS player, are all strongly suggested playing Wisp. Combine with combats, investigations, diplomats, and excellent NPCs, can make a enjoyable time. The BBEG combat is not as violent as First Step I, but still not too easy. And the investigation is actually a little mess for GMs, have to do hard work or your PCs may not know what to do. That's the art used for the named gargoyle in the boss encounter of Fires of Creation. Is there an Iron Gods connection in the scenario? The cover art is not final, and the mockup we have for this season's scenarios is the junkyard stylin' gargoyle that you see there—doesn't necessarily mean there's an Iron Gods connection. Heh, sorry. I guess I just didn't notice it before and my group just fought him last week so it stuck out. Thanks for the quick reply Liz! MUAH HA! Ha... ha ha ha ha... ha... ha! Alrighty, now that I've got that out of my system. I can't wait for everyone to get a chance to play this. I'm hoping it fills a niche similar to the Confirmation, but is different enough to let them compliment one another. Dresden, I think you stole the very ideas I was thinking! Alright, Thursty! I look forward to running and playing this adventure. What time will this be released "today" ??? I've been waiting all day to read it so I can judge it on Friday. I've found that new scenarios drop around (or after) close of business. Scenarios have been released as later than 9 PM EST in the past. @slothsy Thanks haven't ever actually been waiting for a scenario before. Usually other PDF stuff I have looked for on day one (Ex: player companions) releases early to mid day (thus would be out by now). So it is good to know this "delay" on scenarios is normal. Yeah, it's still only 2:38PM there right now if my timezones are correct. Still it is a little disappointing. It's getting late over in my timezone and being New Year's Eve I have to be heading out soon. Not sure why but I really was looking forward to giving this scenario a glance today. I remember that feeling while waiting for Destiny of the Sands Part III to come out! I have to prep Slave Master's Mirror for Saturday, so I know the feeling. Regarding the scenarios' time of release, scenarios typically release around the close of Paizo's business day, which ends up being somewhere in the 5–8 pm range, local time (Pacific Standard Time). This is how things have gone for virtually every release since I have worked here—and possibly before. This month's scenarios are finished and should be showing up on the website shortly. thanks for the update John, I am also excited to pick this one up as soon as it releases! Thank you for all of your hard work. I plan on using this for my first GMing attempt. GOT IT AND THE MAPS. YOU ROCK. A sincere thank you so very much for doing this. This should keep the evergreen fresh. Thank you for taking the time to think this through. This particular aspect of the game can be a huge nuisance and this should help clear things up. Thank you. From what I have read so far you have done an excellent job. The maps in this scenario only copy as black so I cannot import them into Roll20... Please help! Fixed... had to use a pdf to jpeg extractor to get the map images out of the scenario. Reading through this it almost feels like First Steps and the Confirmation had a baby that inherited the best traits of both its parents. I'm really loving the potential for roleplay that this scenario seems to offer. I just hope I can do it justice when I run it next week. Rewards: If the PCs to defeat the creatures in area A13, (with or without help), reduce each PC’s gold earned by 50 gp. Think we're missing the word "fail" in there. I'm not sure I am as pleased with this as I was the Confirmation - some parts of this are just needlessly complicated and could have been drastically simplified and still be as re-playable. Especially part B - that's a lot of resource for very little table play time. Is Onyeka Chaotic Good or True Neutral? Her stat block says one and her description says the other. Either one is legal (wouldn't have been in 3.5, which almost threw me for a second) but they're radically different in how they behave beyond the narrow confines of her description. Onyeka should be neutral--largely tied into her present low-pity/patience style of Sarenrae worship and past events. I see the term "Evergreen" mention what does this pertain too? It can be replayed for PFS credit with a different first level character over and over. Same as First Steps I and The Confirmation. I'm thinkin of running this one at ReaperCon this year. Yeah, this needed a more thorough edit before getting put up. Hopefully that happens relatively soon. Otherwise our VC will have to add a few sticky notes to the pages as to what's what. By the by, the cover page with all the layered images is such a huge file that the game shop's printer can't handle it; it's an older one that wants to cache the page before printing it and it's too big for its memory. XD Actually the file in general could be optimized to be a lot smaller than it is, I think; I'd try running it through Acrobat to shrink it down but I don't know if the security features would allow it. 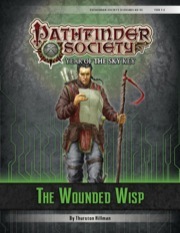 Is there a reason why the taven that the Pathfinder Society was started in, in PFS 5-08 The Confirmation, is named The Pigs Paunch and not The Wounded Whisp as it is in this scenario? Continuity error. Addressed by John HERE. I got a very Da Vinci Code vibe playing this. Looking forward to running this myself down the line. My team also picked up on the pubs name change. A few other things that would be helpful. Only one is really an error though. The map and Section C have the tomb of Arkath the Stonemason in the Eastgate, but the note the players find says Ivy district. It would be nice to get that fixed. It would also be helpful to know where Dreng is (players ask this sort of thing). I stuck him in the Docks 'a street corner far from the Grand Lodge'. I guess he can move around and keep the ever green feel going. Is it anticipated that the whole adventure takes one day? Or that the team rests in the middle. It would be kind of nice to set expectations here. It first comes up in the Wisp when folk overhear about Sir Reinhart's intentions - I guess this is kept loose so the team can stop and heal if necessary? I just had the patrons reply with different times, as nobody is too sure about exactly when he's going to try. As this is a module that new GMs might want to run, extra guidance on this would be helpful. Glad I remembered to come here. Have to run the game tomorrow, and that bit confused me. Updated to include updated Season 7 and 8 versions of one of the Player Handouts. Got my copy. Will be running it near the end of the month. Is this getting a Season 9 update, or is it just going to have 6-8?